Established in 1984, Fence Stores has gradually grown over the years. 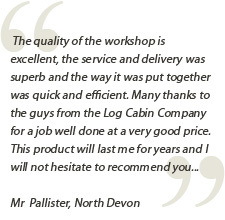 The aim of the business has always been supplying quality wooden products for the garden. In the beginning our market was just fencing but over the years we have expanded to the point that we can supply a full range of timber garden products from log cabins and smoking shelters to Weekend Houses , Garages and Games Rooms. With the acquisition of New Forest Buildings in 2004, Fence Stores entered the Garden Buildings market. The new part of the company is called Stable Structures. Since our original sales site for buildings at Hurn we now have a further four display sites around the country. Fence Stores now employs approximately sixty people across its sites and currently has a turnover of £5.5 Million (2007). Fence Stores puts a lot of its success down to its staff, who are all knowledgeable and helpful, and realise what a customer needs. As well as its staff its product range is one of its keys to success. Fence Stores can offer a full range of buildings, Sheds, Decking and Fencing and joinery quality gates. I would like to take this opportunity to thank you for taking the time to look at our Web site, hopefully you have found a product that you like, now sit back and let us do what we do best!